The Methods in Biblical Interpretation (MBI) series introduces students and general readers to both older and emerging methodologies for understanding the Hebrew Scriptures and the New Testament. Newer methods brought about by the globalization of biblical studies and by concerns with the 'world in front of the text' - like new historicism, feminist criticism, postcolonial/liberationist criticism, and rhetorical criticism - are well represented in the series. 'Classical' methods that fall under the more traditional historical-critical banner - such as source criticism, form criticism, and redaction criticism - are also covered, though always with an understanding of how their interactions with emerging methodologies and new archaeological discoveries have affected their interpretative uses. An MBI volume contains separate chapters from six different well known scholars. 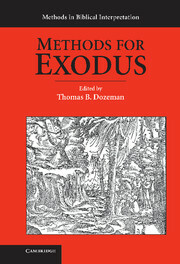 Each scholar first elucidates the history and purposes of an interpretative method, then outlines the promise of the method in the context of a single biblical book, and finally shows the method 'in action', by applying it to a specific biblical passage. The results serve as a primer for understanding different methods within the shared space of common texts, enabling real, comparative analysis for students, clergy, and anyone interested in a deeper and broader understanding of the Bible. A glossary of key terms, the translation of all ancient languages, and an annotated bibliography - arranged by method - help new, serious readers navigate the difficult but rewarding field of biblical interpretation.